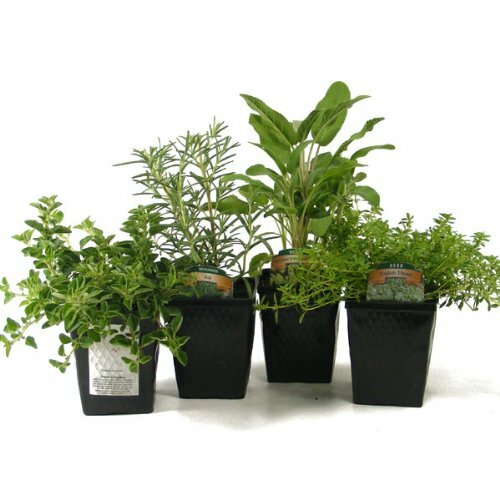 Our organic herb collection containers Rosemary, Sage, Oregano and Cooking Thyme. CULTURAL NOTES: Herbs prefer to grow in porous, very well-drained soil in full sun. Do not over-fertilize. Herbs do best when grown outside but can be brought indoors for a limited amount of time if needed. Plant in larger pots to encourage root growth and to increase the plant size. Herbs do best when trimmed or used on a regular basis. Let dry out completely in between watering. Includes: (4) plants grown in 3.5 inch containers. Herb kit makes a great gift! Contains (1) of each Thyme plant, Sage plant, Oregano plant and Rosemary plant. Grown in 3.5" pots.Grown organic in the USA Includes Herb Planting Tips. Grows well in Zones 5-11. Can be planted outside or grown indoors as a kitchen garden. Easy to grow herbs are ready to be used on arrival. If you have any questions about this product by Stargazer Perennials, contact us by completing and submitting the form below. If you are looking for a specif part number, please include it with your message.